So, two topics I want to get into today that are both based around my DERPer launcher from my last post. So long story short, I've failed to make the DERPer something that meets my initial expectations. However, whenever this happened in the past, at best I'd make a post about it and then move on, sometimes posting pictures of the internals if people were interested, but never offering full instructions. Or in some cases, like the Barackuda, I'd spend a long, long time gradually turning it into something post worthy. But I want to break those habits and just keep moving forward. I'm unable to make the DERPer as good as I want it, but I want to give others the chance to try their hand because I think it's otherwise the basis for a really fun launcher. As such, I'll get instructions later on. Fun launchers are generally made not to necessarily do anything different or better, but to simply be enjoyable to play with. The vast majority of launchers fall in this category since many people need to start off with something before they can figure out innovative mechanisms or maximize performance. While we all generally aim to make something fun, sometimes a concept is unreliable or tedious to work with, or it's rather simple. Novelty launchers try to be the cutting edge of K'nex launching building concepts. This is a category I perhaps am most focused on, and the Barackuda is an example of one. These launchers try to do new and/or interesting things, even if they're not that great in performance or if they're less than fun to use. Generally, you need to come up with a concept and expose it before it can be refined into something that falls into either of the other two categories. Performance launchers are generally designed to get the best range and work very reliably. They're "serious" in the sense that they generally sacrifice some fun and aesthetic elements in order to work as reliably as they can. Often they'll forgo newer concepts in favor of tried-and-true concepts, such as turrets generally being more popular than advanced magazine concepts. You may find that some builders stick in one category more than others. Perhaps some builders more focused on performance might scoff at a launcher that's more designed for fun, or in reverse a builder more interested in fun launchers might criticize a simple design focused on performance as being too boring. Overall, it's important that we understand and accept everyone's different preferences. I think it's good to dabble in all three. Generally I try to make novel concepts and then refine them to perform better, preferably be good enough to use in battles against more common TRs. The Oodassault ended up turning into a performance launcher, and that limited some of the things I could do with it. Likewise, I was obsessed with making the Barackuda perform better, trying to justify its potential use as a battle-ready launcher before I would post it, when in the end it remained more of a novelty and I had to post it accepting that. The DERPer I too have to admit is made just for fun. It isn't the Oodassault and I don't want to try really hard to make it work as well it can because the point is that it's just an Oodammo launcher with a removable magazine. In the past, I didn't post previous iterations of it, nor of any other type of launcher I made just for fun, thinking they weren't worth posting, but that shouldn't be for me to decide. I'd love if others took these concepts and changed them up to be more of whichever category they value more. Thanks for letting me blabber on a seemingly petty topic, but I think it's important to remember there's a place for all kinds of launchers and we should share our ideas and instructions so people are free to build and adjust them to their own liking. I appreciate your patience, truly. While I've bouts of inactivity, something eventually stirs me. In this case, I've been talking with veterans of the old K'nex launcher community and we pondered different ideas together. 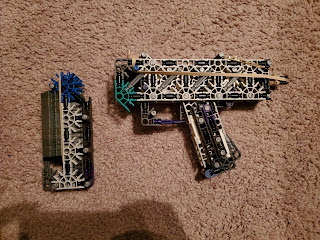 I still had the core body of my BAWler lying around and I kept experimenting, trying to make an improved version of the DERP, if any of you remember seeing that from my Part 2 post on my Oodammo launchers. While I couldn't think up anything for a while and put the project on hold, I revisited earlier this week and figured I could share progress. 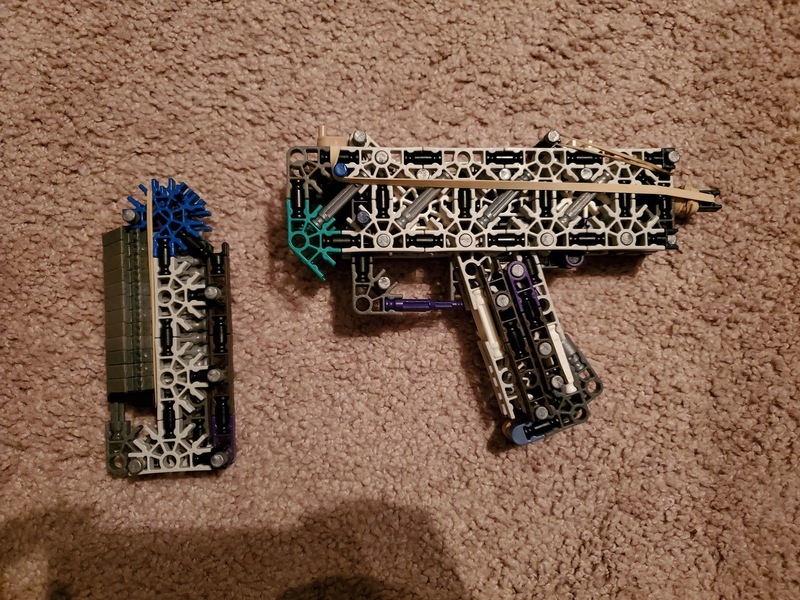 For those unfamiliar, the DERP was just a casual attempt at an Oodammo launcher with removable magazines, and I was surprised by how well it worked, but I didn't like it as much compared to my Oodassault 3. Its magazine was too goofy and the way it connected wasn't smooth enough for me. That said, remaking it now, I do like it as an alternative, I think it's fun to have a removable magazine option. This time I designed the magazine and the trigger guard to allow you to easily slide it straight up into the launcher. It is roofed and has a band such that you can keep them loaded and ready to go without any other manipulations required. The roof doesn't interfere with the striker, so you can insert a magazine into the launcher without having the striker set. I'm nearly done but I'm having a problem with a round getting dragged out behind the launched round, but I think I've a solution. Once it's working reliably, I'll get a video and instructions. Thank you for your incredible patience, I know I said I'd post this soon and it's already been a month and a half. Life flies, y'know? Anyway, you know the drill, I linked the instructions on Instructables here. This is one of my more complicated builds but I'm not exactly a patient picture taker, so do let me know if anything isn't clear enough. As I've said in my last posts, it doesn't perform quite as well as I'd like it to despite all the revising I've done, so perhaps it'll forever remain more of a novelty than a potential war weapon. Still, let me know what you guys think of it if you get around to building it. Just a forewarning that my activity might be a bit slower in the following days, but the hobby never dies, and I intend to keep building, and to keep you updated every step of the way. So this will be a short one today. I've been sidetracked with little, well, side projects before I get back on to stuff I promised for the blog. One of these sidetracks I'm ready to retire, though. You may remember from a previous post the BAW. Its design philosophy was to remain relatively simple, somewhat piece efficient, and just be a novelty. The design revolved around a removable magazine concept that was slightly novel at the time. However, a lot of elements of the launcher didn't age well, and I couldn't really recommend that anyone build it now. It wasn't the most ergonomic and it got pitiful range. I was in the process of figuring out if I wanted it to launch shelled ammo or not to help increase range. It otherwise uses my favorite handle setup and a trigger I came up with long ago. What I was struggling with was how to add a striker guide to help stabilize the striker, and then how I'd add a stock around that. What I realized all the meanwhile was that I didn't actually like the main design elements anymore. The trigger has a part sticking out at the top of the back of the handle. The magazine, the center point of the old launcher, is usable but somewhat flimsy, large, and limited in capacity if using shelled ammo or connector ammo. All and all it wasn't a simple design anymore that also didn't offer any real benefits over other systems for its complexity. I intend to come up with a new design to replace the BAW that truly focuses on simplicity and modularity. I've other personal projects taking priority at the moment, but I hope to reprioritize K'nex soon enough. Thanks for your patience as I develop more fascinating content, but for now I'd like to contribute just an opinion piece. For those familiar with my origin story, I was searching out how to make launchers out of office supplies when I happened upon K'nex launchers. I was surprised with just how large the community was at the time. 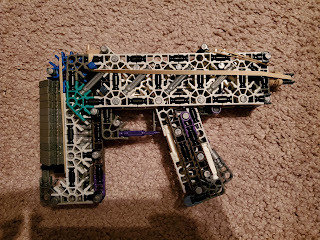 Why are K'nex popular for making projectile launchers (among all other things they're traditionally used for)? Why did I pick them instead of Legos or some other method? I think it comes down to three things: cost, versatility, and ease of use. Buying official tubs and/or sets can be expensive for the amount of pieces you get, but most kids probably had their parents buy them a set or two, providing them enough pieces to get started. Luckily, there are plenty of people who have bought K'nex but no longer want them, and so it's very easy to buy bulk K'nex for relatively cheap. This allows you to amass many pieces. I think it's important to build other people's creations to expand your knowledge on building techniques. Sadly, I haven't done this much myself because I used to lack the pieces to do so. Since having my own income, I've bought more pieces as I needed them and I've been pleased with just how far my dollar can go. You also usually only need a bulk amount of certain pieces while the rest you can keep a moderate amount of and special order just a few more when necessary. 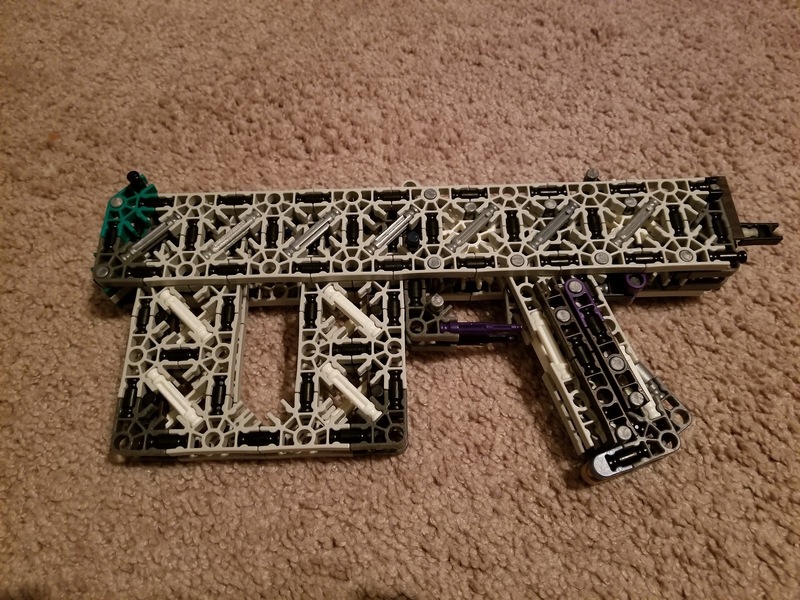 I think the next big thing is just how versatile K'nex can be. They offer limited intended ways of being connected together, but with those handful of variations + some creative methods and careful usage of the plasticity of the pieces, you can make a lot of complex shapes and mechanisms. The beautiful thing about construction toys is how you're usually only limited by your imagination, there's generally almost always a way to accomplish anything you can imagine. And yet, somewhat ironically, a lot of the fun is in trying to work around the limitations that are there. For example, K'nex simply aren't designed for being launched, they just aren't. Yet we view that as a challenge to get around, not something to discourage us from building launchers. We try to maximize the range of our launchers with building techniques for the launcher and the ammo. Finally, I think the main thing that seal the deal in comparison to another method, such as Legos, is the learning curve. K'nex are deceptively simple. There are only so many pieces that exist. They are designed to be a child-friendly toy after all. You can build large, stable structures out of a handful of pieces. 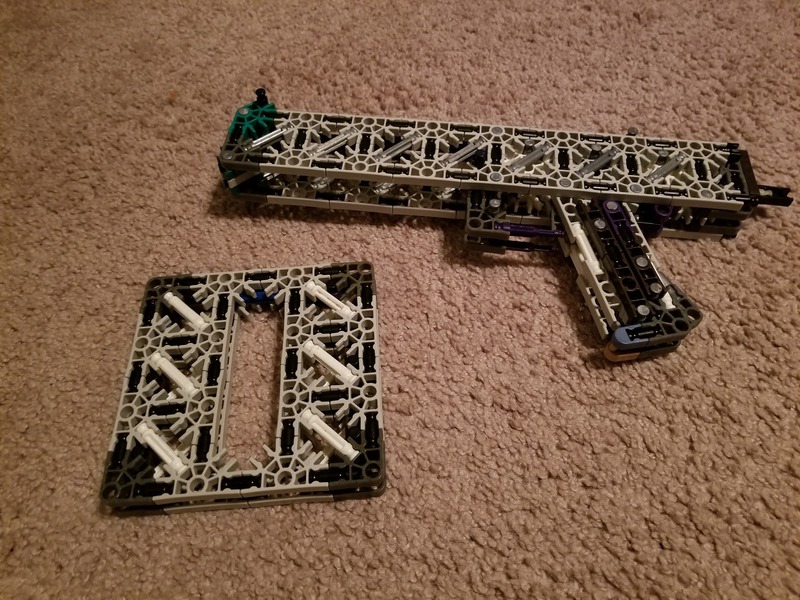 I think this is what's the most appealing, it's so easy to get into, and a lot of people started with K'nex to build other things like vehicles and other simple static structures. Then you can gradually expand your building capabilities to things that move and perform actions. That first lesson I did with only a handful of pieces and simple techniques demonstrated how easy it is to make a projectile launcher. When it's easy to get your foot in the door, it's more likely to stick as an interest because you get results faster with less experience compared to something else that requires more trial and error to get functional. I'm not that much of a hands-on kind of guy, I much prefer working with computers and ideas than physical objects, but K'nex are easy enough to use that it's one of my few physical engineering hobbies. So those are my thoughts on why K'nex is so great for making projectile launchers. I do think it's a fun hobby that teaches people the basics of engineering and problem solving. I believe that all kids should be given the opportunity to experience a construction toy of some sort. And then I also believe that adults should maintain a problem solving hobby to help keep their minds sharp. What do you think about K'nex and construction toys in general? Am I missing something about what makes them popular? As a child K'nexer, I primarily relied on my parents' digital cameras/camcorders to get pictures. The result was I only got pictures of things I was immediately ready to show, as I'd typically go upload them and then clear them from the camera. But then after getting it, for a time my DSi was my primary method of picture taking. Regrettable because the quality was notably worse, but it was nice in that it was more readily available and so I took more pictures of dumb little concepts I'd make and never post. I'd eventually upgrade to a 3DS, moving over old photos and taking new ones on it. There's more than I thought there'd be, but not that much to explain so this will be a slightly longer post. Some of these I remembered having but couldn't find, so they weren't in the appropriate posts. I'll probably go back and update them. So this is interesting but I guess I never found it worth showing. It's basically a bolt action assault pistol based on a modified Oodassault 2 frame. I think it worked OK, but I didn't like the bolt setup. Looking at it now, nothing would've kept the projectile held in the chamber either. I think ultimately it didn't make sense to try to get the performance out of a bolt action in a pistol-sized launcher since it would've been limited in range anyway. Ah, I don't know if you remember me mentioning elsewhere, but here's that sub-carbine UMP model I made up. It was designed just for looks, to take the UMP design and make it look more like an assault rifle. 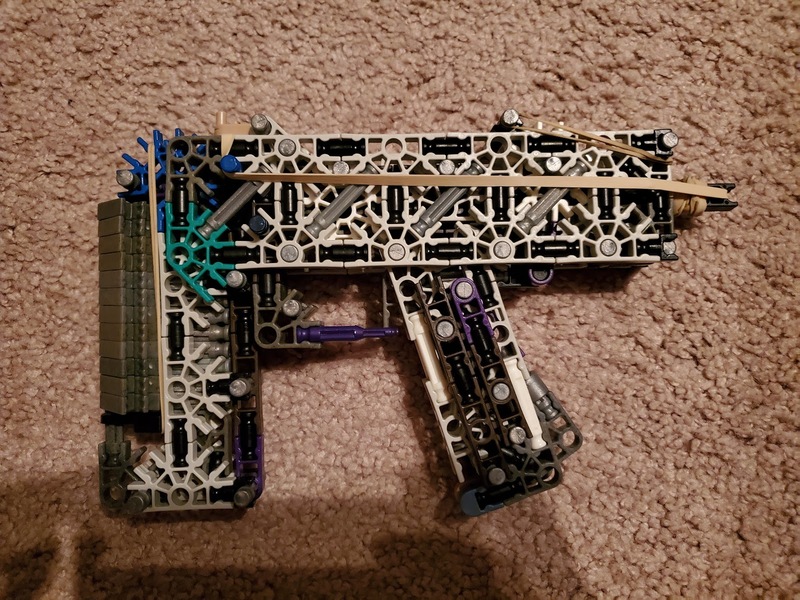 This weird one I believe was another attempt at making a Thompson-esque launcher? I was trying out a concept where the striker was connected to a charging handle exposed directly out the top to allow for easy recharging. I didn't like how the magazine connected, though. I also decided that I really liked the design of my TDS but I could never quite make it as functional as I wanted, so I remade it as a nonfunctional design a handful of times. One time I also made a few attachments. If you recall from my shot launchers post, I came up with a flat shell design. This was the beginnings of a magazine for those shells, but it would've been difficult to design a launcher to take it. Due to the size of the shells, it would've been a large magazine to only hold 4-5 shells, so it'd be more of a novelty. I apologize for just how blurry this one came out but I have no other examples of it. If you recall, I attempted a bullpup bolt action at one point but determined it probably wasn't worth pursuing further. Well, I guess I decided to give it another shot after learning some newer design concepts. I still came to the same conclusion that the stock would have to be unreasonably long to contain the action. So this was my basic shot launcher that at first I thought I didn't have any pictures of. As you can see, the design was much more rudimentary compared to the design someone else would eventually post for me. This was more just to demonstrate the concept. As you might recall from my non-functioning launchers post, I basically started with the PDR model and gradually turned it into my own design. This was I believe the first one I designed. Finally, this one I actually intend to post instructions for since it's fairly simple. This was a challenge I did for myself to make a 3 layer launcher entirely flat. Most launchers use white rods (for 3 layer designs) or blue rods (for 5 layer designs) to hold the body together, resulting in the edges of the rods sticking out of the sides. This one utilized a quirk where green rods can fit in the gaps between connectors (one of my favorite tricks which I still use often). The trigger was definitely the trickiest part. And with that, I'm done with pretty much everything I've ever made or contributed in the past. I'll visit some other noteworthy concepts by other builders that I'm able to dig up enough information on, talk more generally about certain concepts and their potential futures, talk about any current projects I'm working on and get instructions when I finish something, and of course hopefully get that guide series back on track. Been a busy week so I'll have to put off instructions for the Barackuda a little longer. So I'm going to get back to all my random concepts. Let's carry on right where left off, shall we? I have only four left, but they're all newer, and so they're generally a little more interesting. So this is definitely one of my more out there concepts. There are these certain gel pens that I liked that had these thick ink tubes in them. I discovered they were pretty much the same diameter as K'nex rods. Then of course I should make a launcher for them, right? As silly as it was, I recall they did have much better flight characteristics than K'nex rods. 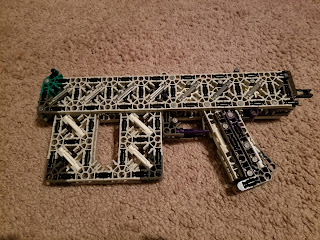 It used a top loading magazine and a striker that was charged via an open side in the stock, however I didn't quite do a good enough job constructing it, so the back of the striker guide would come apart. Between that and a lukewarm reception, I didn't feel inclined to pursue the concept further. I don't remember exactly when this was, but I guess it was soon after the Oodassault 2. I figured out a simple way to connect a removable green rod magazine, so I made a simple assault pistol to demonstrate. However, green rods aren't all that great an ammo, so this wasn't all that useful since Oodammo had just become popular, but I figured maybe it could be used on a functioning model. So this was a nice thought with horrible execution. I had just gotten back into K'nex more seriously during my freshman year of college, perhaps this was the summer. I was talking to another vet member who popped in for the first time in a while. We discussed the physics of K'nex launchers. I won't bore you with the details, but basically understand that projectiles can only be launched about as fast as the striker is moving by the time it hits the projectile. The rest of the energy left in the striker is wasted into the back of the launcher. I thought this was silly, why not try to use it for something? So first idea that came to mind was to use it for a "bolt action" where it did the loading automatically when hitting the back of the launcher. However, this was a pipe dream because I was, ironically, ignoring physics. I was hoping the projectile would've left the chamber before the next round would get loaded. I had never completed the mechanism, let alone test fired it, but I'm pretty certain it wouldn't work. It's a shame because it was otherwise setup to be a compact bolt action if I gave it a manual bolt operation, but it was top loaded instead of with a removable magazine, which I wasn't sure I liked. I've thought of a better system for an "auto-chambering" launcher that should actually theoretically work, but I haven't been able to pull it off yet. This was also back in college, my third year I believe. I can't emphasize enough how much I struggled to make my own bolt action, but I'd keep trying every now and then. One big self-requirement was that I'd give it a removable magazine. I had the idea for the magazine originating from an evolution of the BAW magazine floating around for a long time but never knew how to apply it. Here was one attempt that made a somewhat compact frame based on the barrel of my Oodassault 3 series. While I had a sear in place, I didn't know how to connect it to a trigger. I disliked the look and the high bore axis (distance between the barrel and the handle) so I didn't try to make it work for all that long. That's all that I have readily accessible right now. Like I mentioned previously, I believe I have a few more examples on my 3DS, I'll get those someday.